Travel Myth #1: The kids won’t remember. Families often are concerned about spending money and time on vacations they think kids won’t remember. While it is generally thought that permanent memories can be made as early as age 4, new research suggests memories can be made even earlier. Even though kids might not remember the exact details of the vacation location…what kids will remember is family interaction. Family interaction on vacations with more time spent together chatting and talking about experiences increases communication skills in infants and toddlers while improving vocabulary of older kids, too! Most adults surveyed (62%) said their earliest memories were of family vacations taken when they were between ages 5 and 10, and they remember childhood trips more clearly than school events or birthday celebrations. Youth surveyed strongly agreed that they get to see and do things on vacation that they’ll remember for a long time (64%) and that vacations bring their family closer together (53%). Children who traveled with their extended family reported that they get to spend quality time with their grandparents (78%), they feel closer to them (60%), and they like to remember stories about what they did with their grandparents (65%). So…how early can they remember? Interestingly enough…..very, very young, but some of those memories fade away and thus, adults don’t remember things like their 2nd birthday parties. The earliest forever memories are thought to come at about 3 1/2. 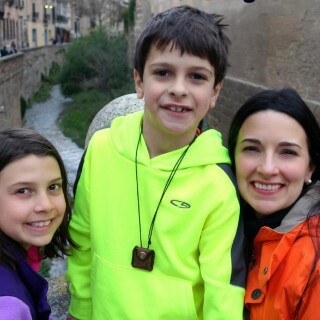 Travel Myth #2 – I won’t enjoy my vacation because of all the kid wrangling. Banish the thought that you can’t enjoy your vacation with the kids! Do not fear! Keep the kids busy. Use my travel guides for interesting history and activities for your kids (and are like Cliff Notes for grownups). If you don’t see your destination, give me a shout. I’m always working on new ones! Share with the kids. Your observations and thoughts. Vacation WITH the kids – build memories and enjoy the memories you make. They will last a lifetime. Take your favorite Aunt on vacation, too! What a funny memory! How old were you? I am all for traveling with kids! It is more work, but more rewarding, too, in some ways. And I like your point abut them not needing to remember the details to get something from the trip. This is very reassuring! We don’t have kids just yet but plan to within the next few years, so we’re starting to think about ways we can continue to incorporate travel into our regular lifestyles even when we have kids. Some great advice here! As I have a 2 and a half year old I have actually thought about this before. I take her away because I love to be with her and the pictures we take, she can look back on when she’s older. Hopefully they will mean something to her and she’ll probably want to go back and recreate the photos when she’s older. So the official age of being able to remember is 3 and a half, very good to know. Such an important post. Being an strong advocate of family travel, even with small kids, I can’t agree with you anymore. I always get into debates with people on this topic and i’ve traveled as a child and take my children on all my travels so I know. We don’t have children nor plans to ever have children. It’s always great seeing families with well behaved children off exploring the world. I don’t see why parents avoid it. Then again I guess some parental alone time is always needed!! Wonderful post! I love, love all the pictures…beautiful! !